Offering you a complete choice of products which include end suction pump, multistage end suction pump, mini hygienic pump and self priming pump. We are the leading manufacturer and supplier of an excellent quality range of End Suction Pump. These are applied in various industries, the Progressive Cavity Pump has been used as fluid transfer pump for years. 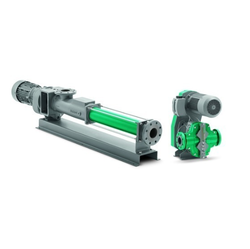 These Progressive Cavity Pumps have the ability of pumping or transferring high and low viscosity products, with or without solids or long fibers, in suspension. We are offering our clients an extensive range of Multistage End Suction Pump, which is procured from Wilo. Our entire range caters to the requirement of general industry applications, pressure boosting systems liquid transfer and chiller. These Multistage End Suction Pump are known for their high flow velocities, compact design and excellent working life. Mini Hygienic Pump is employed for hygienic applications in the foodstuff, pharmaceutical, cosmetic and chemical/biochemical industries in order to provide continuous, pressure-stable, gentle and low-pulsation conveyance with optimal cleaning and dosing in proportion to speed. Our valuable clients can avail from us a broad range ofSelf Priming Pump. These high-quality pumps we offer are internationally known for their strong construction, easy installation, and smooth functionality. Our quality auditors manage a variety of tests on these products to ensure that high-quality products are offered to our esteemed clients.